New York, NY Wednesday afternoon the gay space advocacy group Gay Astronauts Searching for Intelligent Extra-Terrestrials (GASIE) released a press statement calling for a mission to send an automated probe into Uranus. This announcement comes in an effort to renew the American drive for space exploration that the Bush administration publicly advocated earlier this year (though Bush has never mentioned Uranus specifically). �Our hope in this mission is to ascertain the source of the gaseous emissions coming from Uranus and determine whether they are toxic or not,� said Chief Scientific Coordinator for GASIE Anderson Buttz. Some were surprised by the announcement. 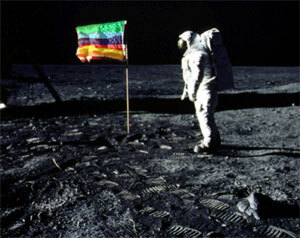 Many who read the press release had never realized how gays felt about space exploration. GASIE president Baldwin Arse defended his stance. According Mr. Arse, Uranus could be a significant place for discovery. Speculation has also surfaced to the possibility of sending probes with life forms on them to assess the acidity of the environment and whether life-forms can survive there. Some analysts expect gay astronauts in the future to develop probes that can contain some small life form such as a gerbil, perhaps. There are complications related to such plans, including solving the problem of getting the gerbils back out. Want to find out more about Uranus? Click here!